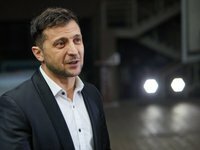 The headquarters of presidential candidate Volodymyr Zelensky has appealed to Ukraine's Interior Ministry to provide protection for its candidate, the ministry has said. "Before the first round, during the campaign, we guarded nine presidential candidates. At present, the staff of presidential candidate Zelensky has requested protection," Interior Minister advisory Ivan Varchenko said during a briefing in Kyiv on Monday. Varchenko said the National Police is in communication with the headquarters of both presidential candidates and communicates with all subjects of the electoral process.